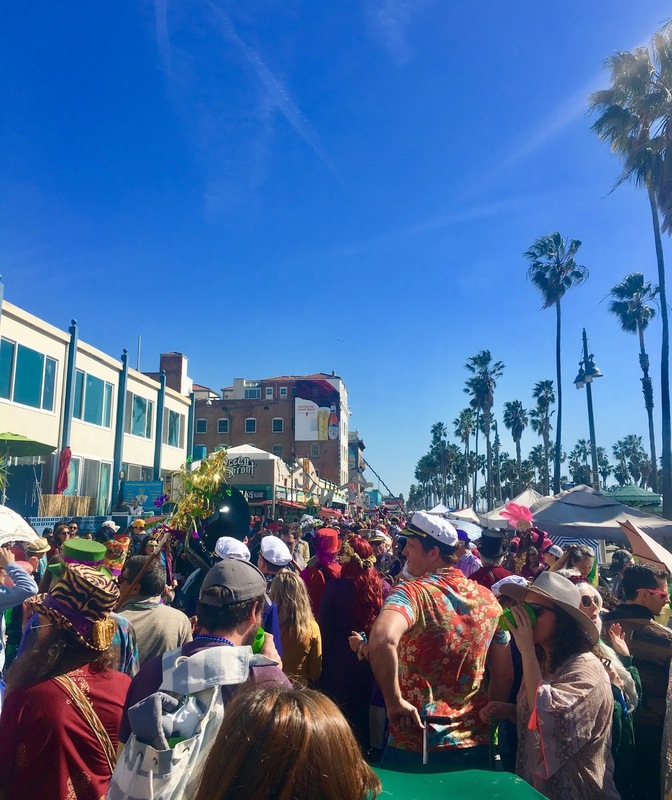 People have really needed to blow off some steam lately, if the size of our annual Venice Mardi Gras parade was any indicator. The crowd was bigger and better this year, and the level of costume participation was unprecedented in my experience. The beautiful day might have had something to do with it too, as after weeks of super cold and wind and rain, we got a bright, warm, sunny day in which to revel in - and boy, did we revel! 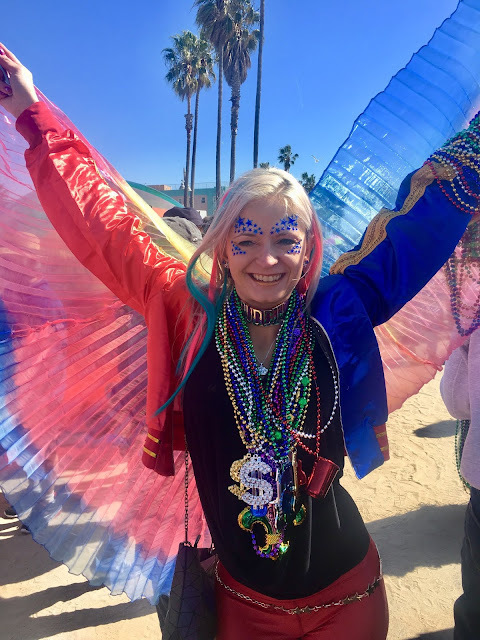 The posted parade starting time was noon, but I knew this meant Venice Standard Time, and sure enough, the Mardi Gras Krewes assembling at the Rose Avenue beach parking lot were still there mingling at 1:30 PST. That was a good thing though, as more people showed up, and more people were more buzzed up after their time inside the Venice Ale House - which makes for a good parade. 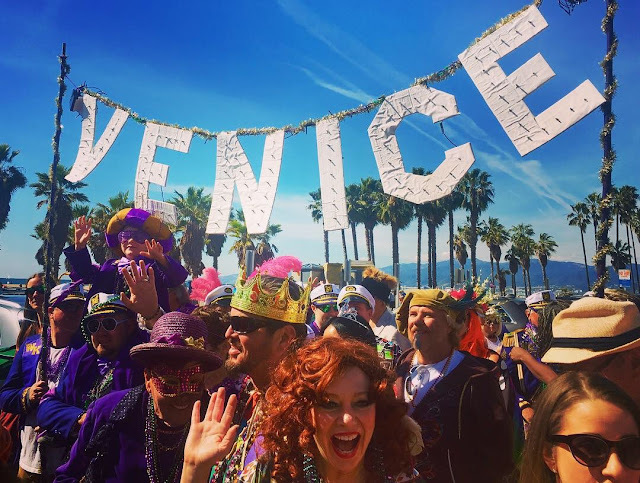 Mardi Gras Queen, Deanna Navakuku, and King Paul Rivas were all robed up and ready to reign over a day of Venice magic. The costumes were very colorful and impressive, as most did their best to be on theme with the "Magical Mystical Tour" vibe chosen for this year. The actual cover of the similarly named Beatles album is pretty creepy, with like pig furries in scarves, but surrounding them is a swath of psychedelic Day Glo swirls ... so I went with the rainbow tie-dye (also honoring Venice's hippie past) and matching Mardi Gras mask. I feel I'll get more use from the dress for sure, in these parts - AND it's the 50th Anniversary of Woodstock this summer, so I'm all set. There was a silvery jellyfish, a parrot, a majorette ballerina, a wizard, a butterfly (Miss Jessica Sugar Long - co-founder of this extravaganza with her husband Johann since 2001! ), among a ton of other great outfits. As ever, the Venice sign was held by the purple jacketed members of the Windward Krewe. The Gumbo Brothers brass band (led by co-founder Johann Stein)and the hula hoopers finally struck up the tunes and begain to twirl, and we all set off down Ocean Front Walk, to the delight of the many tourists that had no idea that this was all happening. 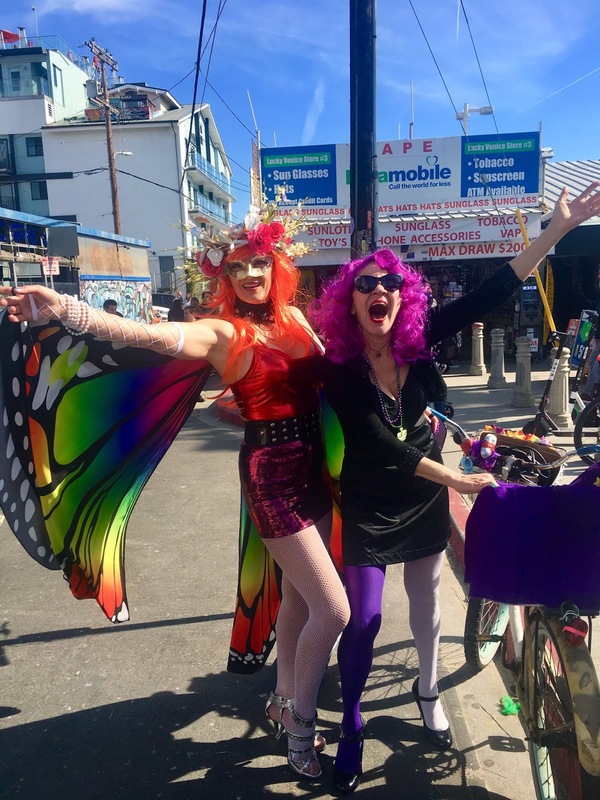 Just another colorful, fun day in Venice! If they only knew how precious and necessary these events are to keeping our Venice colorful, and yes, weird. 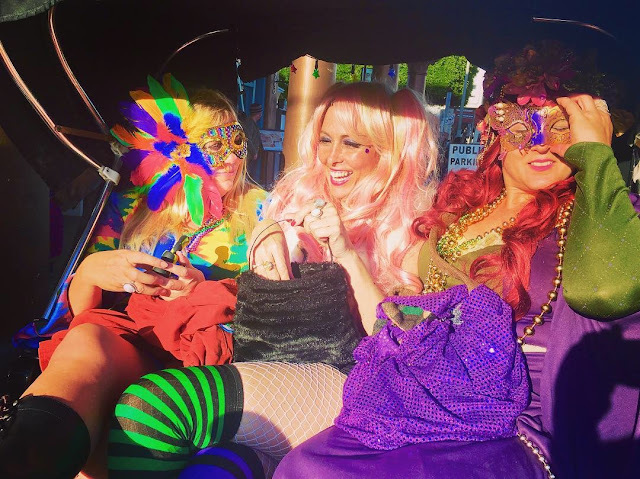 Everyone danced along, tossing out the colorful beads synonymous with Mardi Gras everywhere. 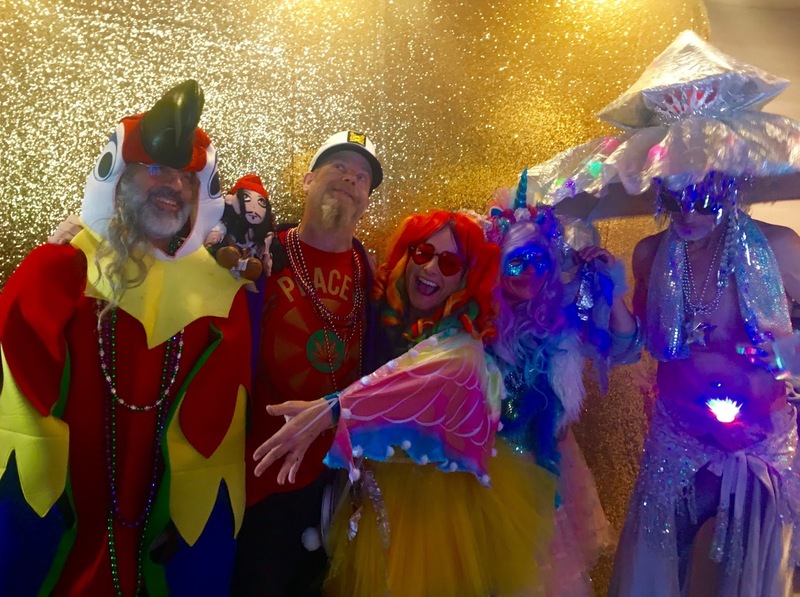 (And by the way, this is a grass-roots party with Miss Jessica and Mr. Stein providing the beads and fun off-set only by donations!) 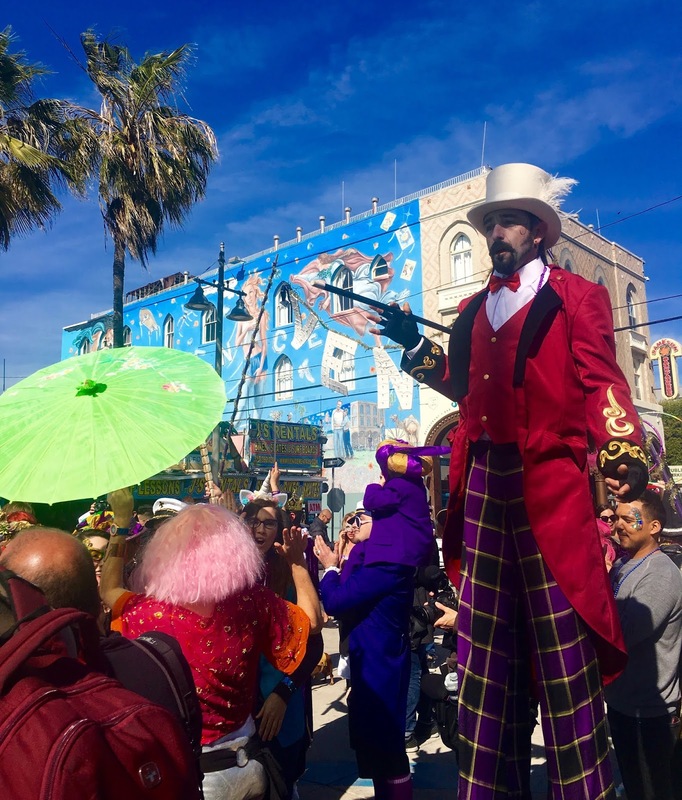 Cameras were snapping all along the parade route as people couldn't believe their awesome luck to be in Venice on such a fun day. People were hanging over their balconies - just like in New Orleans - and blasting off confetti guns to rain down on the parade passing by below. This got a grateful roar each time it happened, and amped up the good vibes even more. Visitors standing along the sides of the parade would join in so that by the time we all got to Windward Plaza, the crowd had grown to be pretty dang big. We all danced around to "When The Saints Go Marching In" and "St. James Infirmary", posed for about a zillion more photos. Then it was time to head on into Surfside, where The Gumbo Brothers would keep the party going for all of the parade partiers long into the evening. Tree Man was there, all dressed up in formal wear for the occasion! 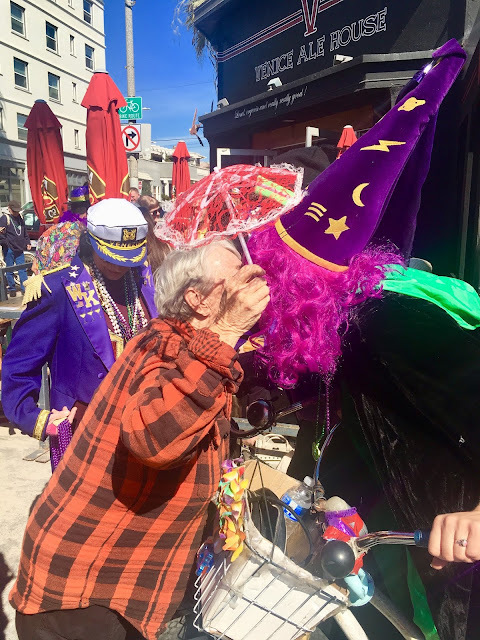 That was something special to see, and he had a tall friend this year, with a fellow on stilts done up to look like an Abbot Kinney sort. Good times indeed! 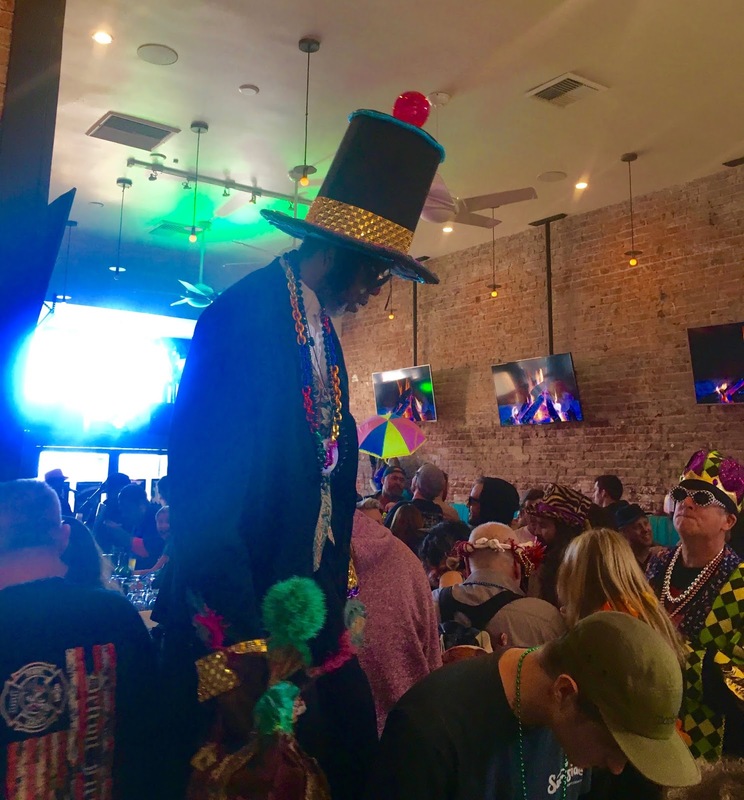 There was a special Mardi Gras menu at Surfside, featuring Po' Boys and Hurricanes, and the venue was once again a gracious host to all of the Venetians hell bent on having the best day ever - and I think that was pretty well accomplished. Venice Paparazzi was there with a fun photo booth, and all the good moments were captured and then some. Had you just landed in Venice for the first time on this day, and seen all of this joy, fun, and love for a community, you would think this was the ultimate place to be, and that it lived up to all you'd ever heard about this magical, mystical place by the sea, as far west as one can go. And that's just how we like it. These are just the kind of days that reaffirm we're all in the right place, all we types that don't want to be in a place that's just like everywhere else. That's why we parade. That's why we dress up. 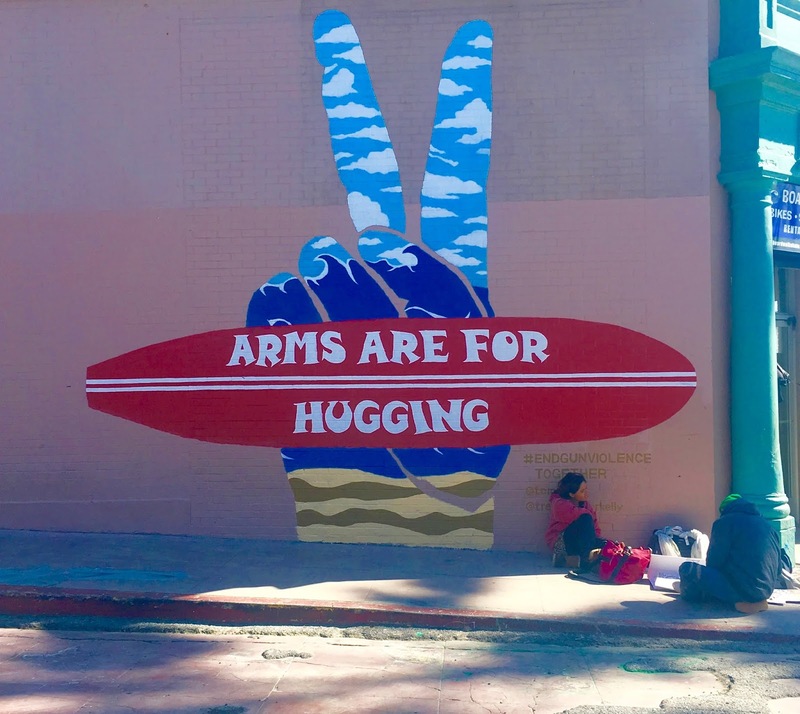 That's why we make art and music and love here in Venice. So that we know that there is still someplace special in the world, where we are all free to be you and me. And THAT is how you let the good times roll! 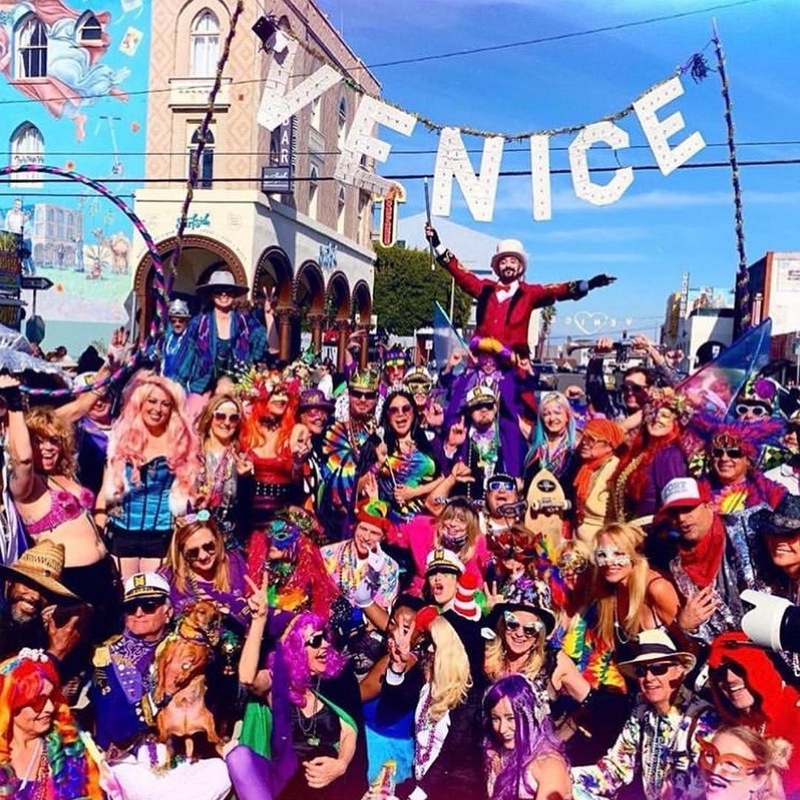 One more awesome Mardi Gras in Venice, Everyone! Thanks and LOVE to everyone there who knows exactly what I'm talking about. You're all just the best. 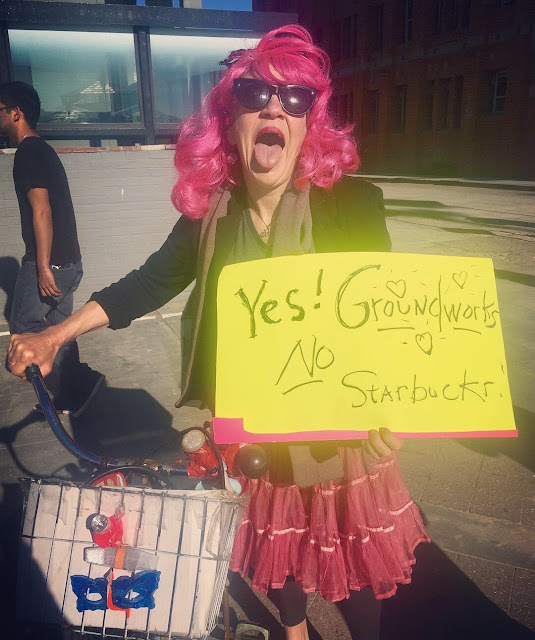 In keeping with yesterday's theme of Venice offering up the message you need when you need it ... today I was heading back from the Farmer's Market on a brisk but bright and sunny morning, and there it was. Another sign. This time on a fence, that caught my eye because of the happy little yellow flowers peeking out from underneath of it, like, "Look here!" More truth. "Once in a while you get shown the light in the strangest of places if you look at it right." Yes, you do. And a little "Scarlet Begonias" quote from the Grateful Dead is always fine. And right after I saw this yet another sign from the Universe, I had a meeting where some light was shown to a project of mine, from a source that I hadn't thought of at all. 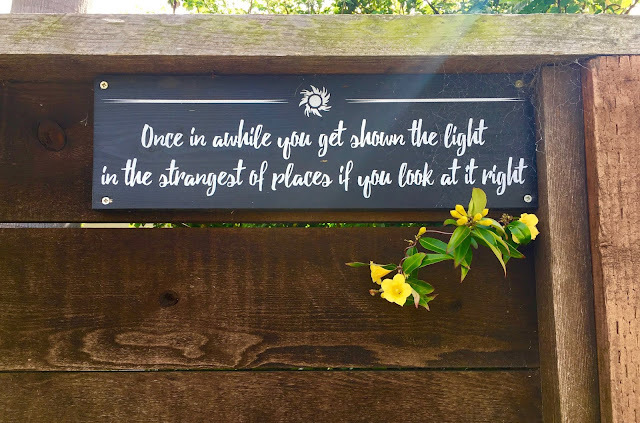 I hope I'm looking at it right, and that it all works out, but either way, it reinforced the notion that being shown the light often happens in unexpected ways, from unexpected - often surprising - sources. Especially if you're open to it - wide open. 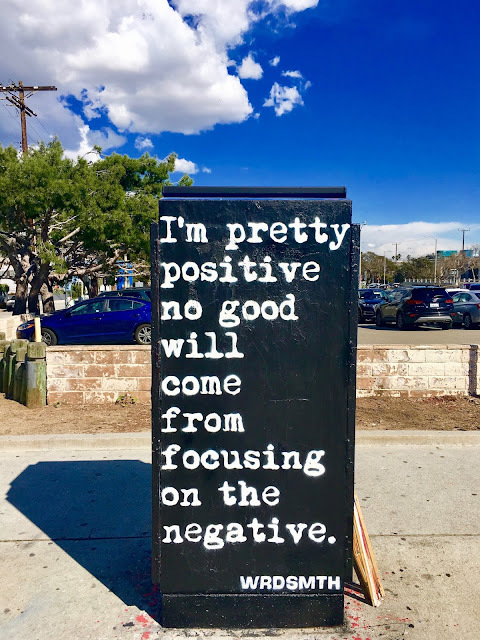 Take this sidewalk wisdom with you as you launch into the weekend, and if you're also looking for some light on a subject, I sure hope you find it! Best of luck! *A great place to find light - at least lightheartedness! - will be at tomorrow's Venice Mardi Gras celebration! We meet at the Rose Avenue parking lot at the Boardwalk at noon, and parade from there to party at Surfside. Hope to see you out there letting the good times roll! Man, there's been so many times where I've been walking around Venice and I see just what I need to see in that moment. There's been a lot of frustration and delays for me lately, and sometimes you have to wonder what you're even doing where you are ... and then you get a little encouragement from the streets/the Universe to hang in there. 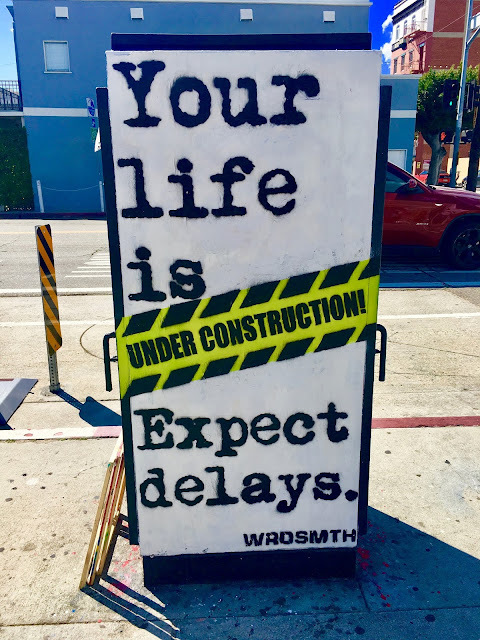 Your life is under construction at all times - and you should expect delays. No matter what is going on in your life, negativity never helps, so the flip side of this utility box adorned by that prolific street artist, Wrdsmth, tells you that "I'm pretty positiveno good will come from focusing on the negative." - and that is exactly what I needed to hear right then. If you're dealing with some lameness at the moment (and who isn't? ), I hope this little pep talk will help you too. Thank you to Wrdsmth, and to Venice, for setting me straight, and for the good vibes that are always here if you are looking for them. Chins up! 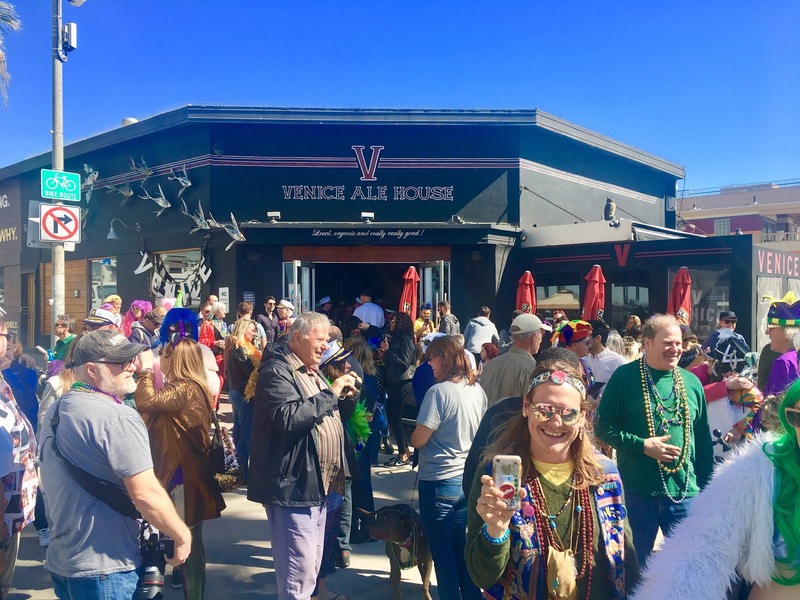 There were several community events going on around Venice this past weekend, with plenty of chances for everyone to get in on the fun. There was the Black History Month exhibit and conversation at the Venice Library. There was the "Venice Hootenanny" in Oakwood Park put on by the VNC that was really just a small stage, a big Jenga and Connect 4 game, and that's about it. 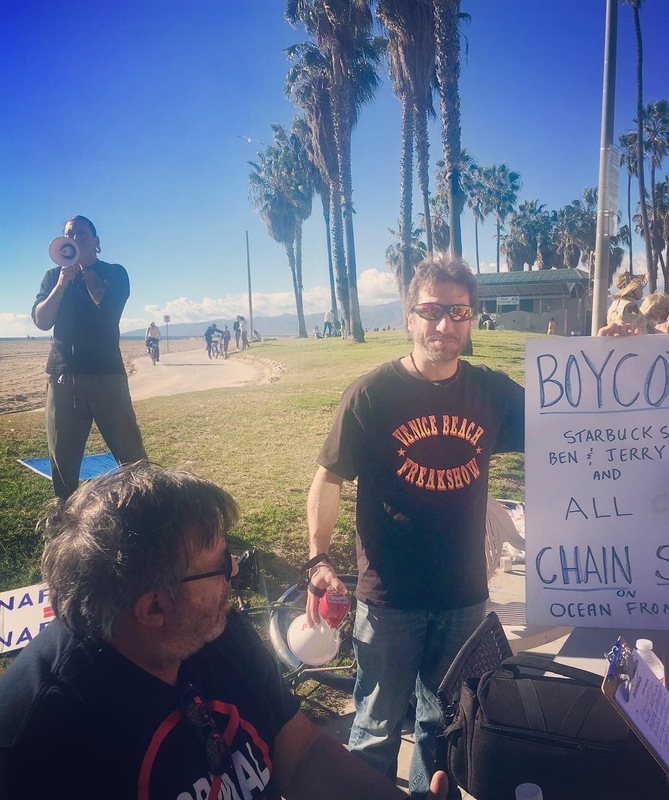 No food, no drink, no bathrooms ... if it weren't for some of Venice's favorite musicians playing (Paul Chesne, Tom Freund, etal ... ) it would have been a complete bust. Better luck (or planning) next time, folks - but at least we had sunshine and friendship, and that's a lot. The coolest event of the weekend was the public performance of Façade Of Time, a kind of dance piece that traveled all through the streets of Venice to the Breakwater. 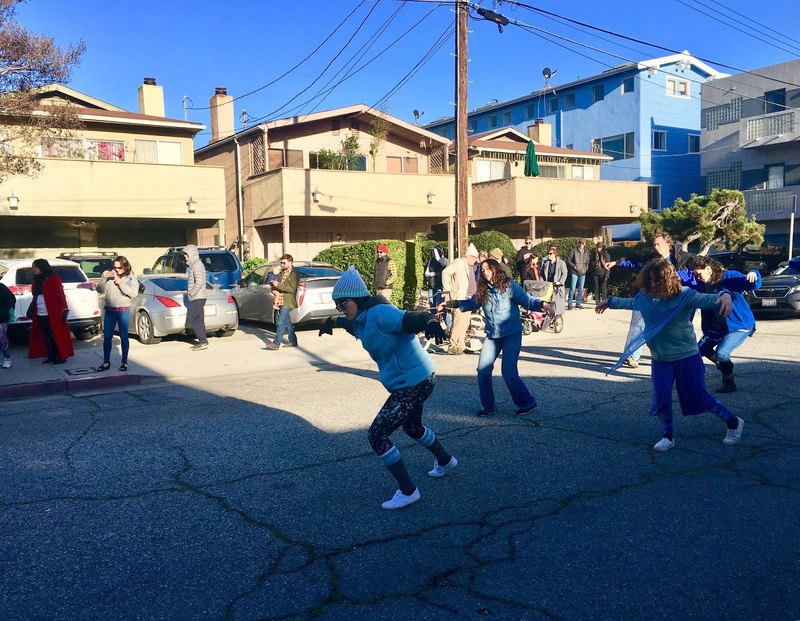 The Body Weather Laboratory was the organization behind Façade Of Time, and they started their performance at the bridge at the start of the Venice Canals. An otherworldly voice chanted from under the bridge - with its awesome acoustics - and then a little raft emerged with a woman singing. 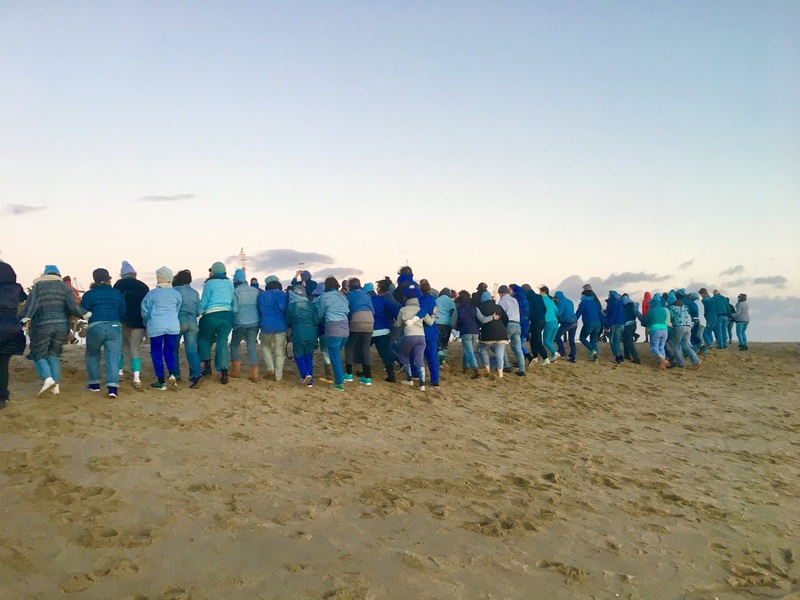 Performers were scattered throughout the crowd gathered, dressed all in blue, and chanting back to the woman. 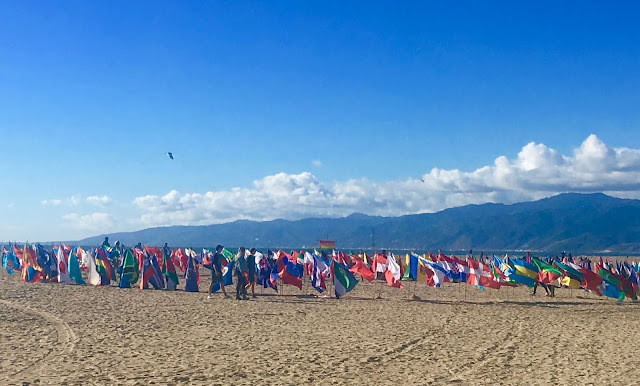 It had the feel of a co-ed monastery, with 60 blue monks of all ages, races, and genders together calling all of Venice to worship. The monk vibe changed to a bit of a zombie vibe as the performers then all began to walk ultra-slowly across Venice Boulevard and down Strongs Drive to Venice Way. The crowd grew as we all followed behind and along the dancers/walkers, with a reverential silence the entire way. 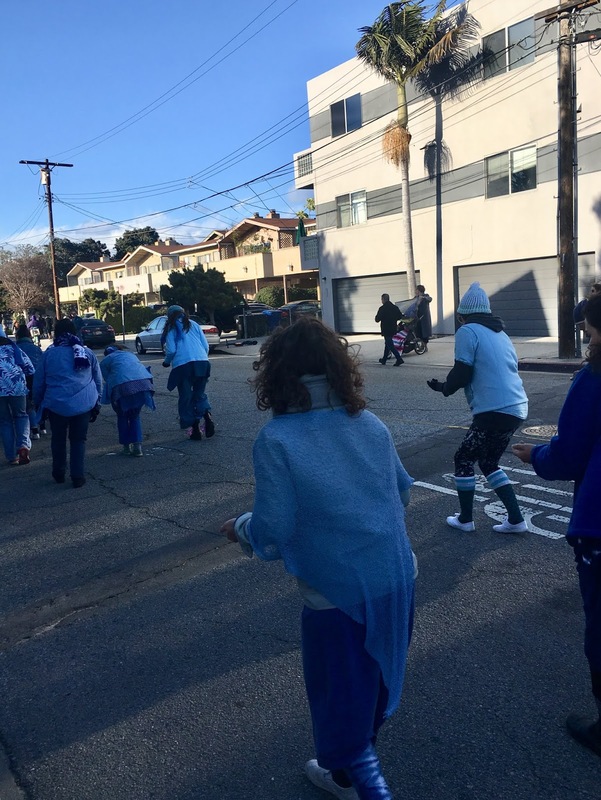 A passerby asked if the whole town was out taking a walk together, and yeah, we were. There was also a reverence for Venice itself as the performance moved along its streets. 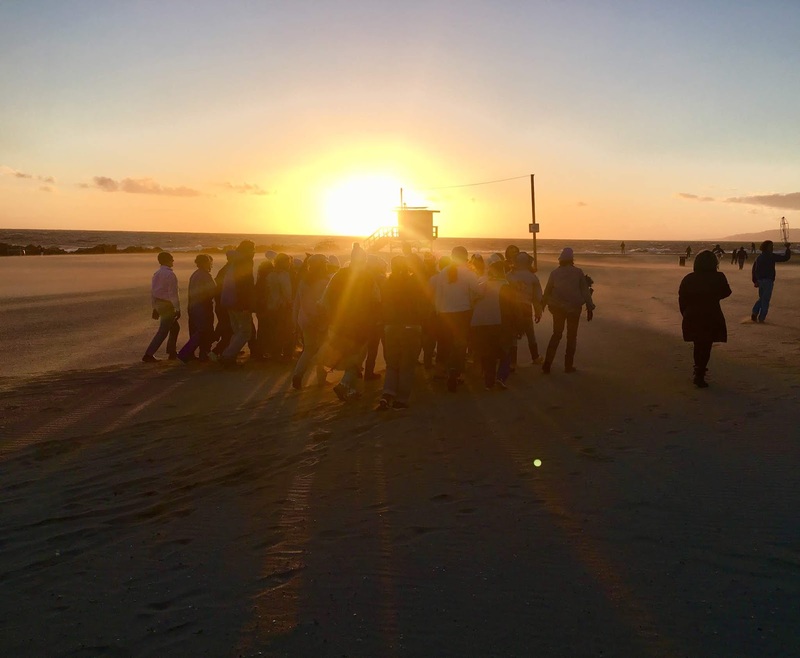 Performers would touch a plant, or a fence, or a wall, with such awe and respect that it was like aliens discovering a new place, or like the ancient Tongva people that used to live here having the ultimate respect for nature. It was moving to see ... and to be a part of, just by being there. A tourist girl going by said, "I don't get it. Is this a funeral of some kind?" And in a way, it kind of felt like it. A funeral for Venice ... for art ... for the past ... but as it progressed, and you saw how the experience was affecting people (Venice is still cool! Venice is still out there! Venice is still art! ), by the time it was over, it became a true celebration. 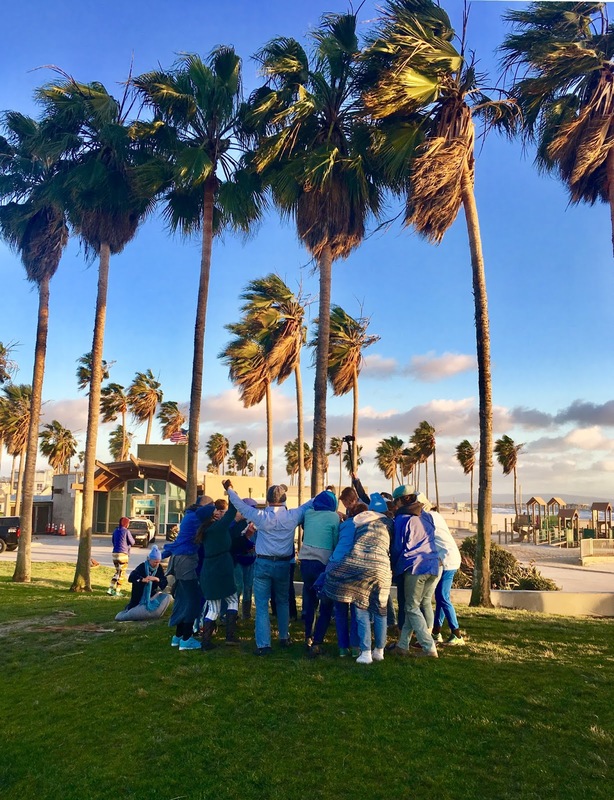 That is a goal of the Body Weather Lab, as its mission statement for the piece talked about how they aim to collapse barriers and enable everyone, without hierarchy, to have access to art. This was most evident as the piece moved through Windward Circle, and the streets became more populated. 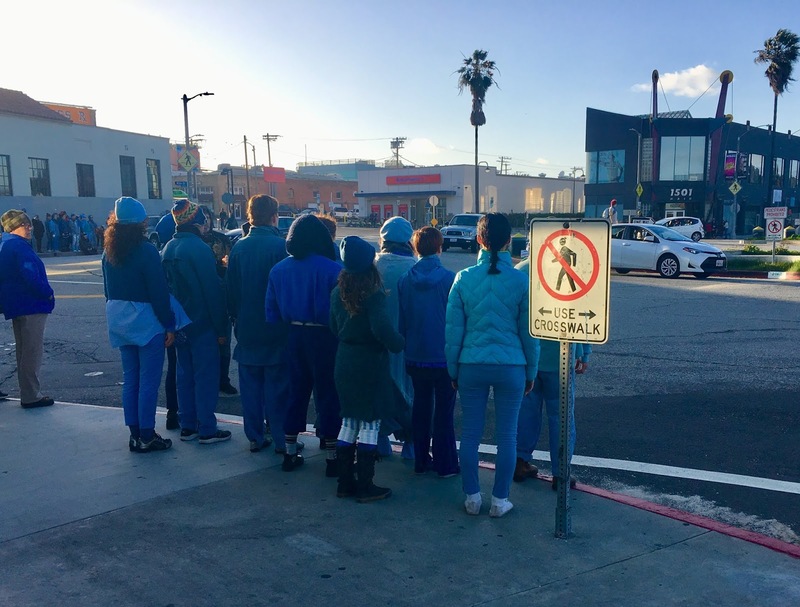 The homeless pushed their carts by as Teslas had to stop for the big group passing in the street (One driver dared to honk, only to be glared at silently by the entire group). The dancers split into four groups, one in each direction of the compass. The woman who had been singing under the bridge was now in the center of Windward Circle, directing her choir. 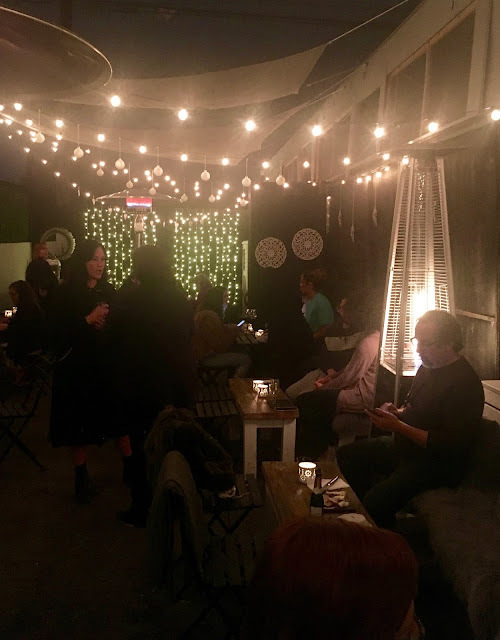 A mystical New Age-y music was in the air, and everyone was wondering where it was coming from (and why it isn't always being blasted out of Windward Circle? ), only to realize that the cars making a tight rotation around the circle were actually all broadcasting the music out of their windows, providing a musical background atmosphere for the chanting performers on all sides. Trippy! Right then, a man got off of a Big Blue Bus with his bike, and I wish I'd been able to capture his face. Total confusion, but with a smile, like "Where have I just landed?!" This is how I felt long ago when I first stepped on to Ocean Front Walk and knew that this would one day be my home. That this was a magical place, like no other. 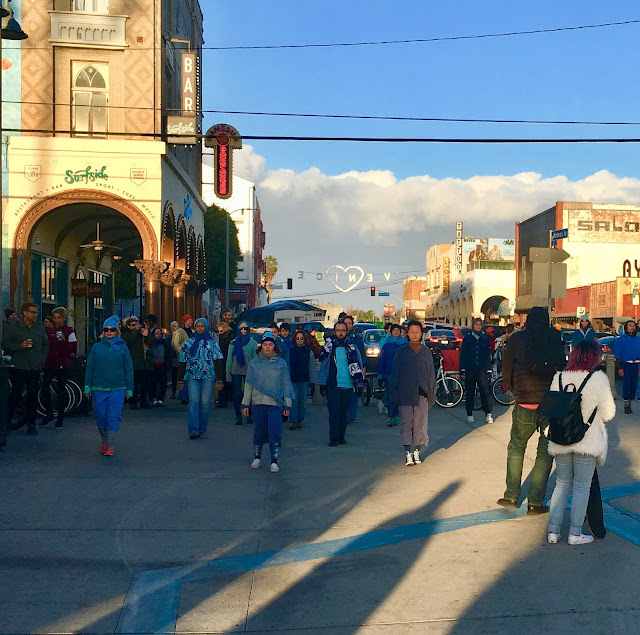 Imagine just getting off the bus and stepping into this scene ... it made me so happy that our Venice is still capable of blowing someone's mind. In a beautiful way, at that. The now much larger group processed across Pacific and under the Venice sign, making its way to the Boardwalk. 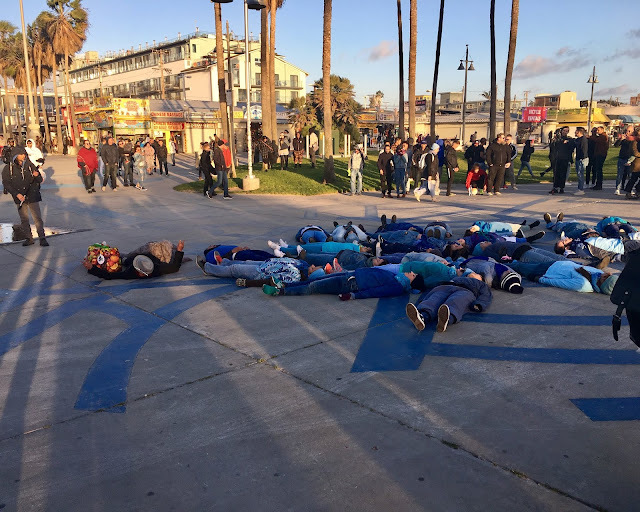 All of the tourists were stopping and staring, wondering ... and then they joined in. 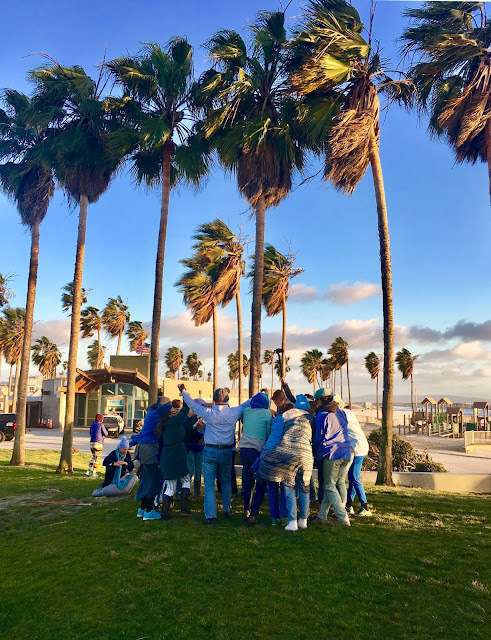 This might have been the windiest day I've ever experienced in Venice, and the gale force winds only added to the drama of the performance art happening right in front of everyone's faces. One group of performers laid down on the ground in Windward Plaza, and individuals took turns hopping up and shouting a Venice street name ... "Electric Avenue!" "Nowita Place!" 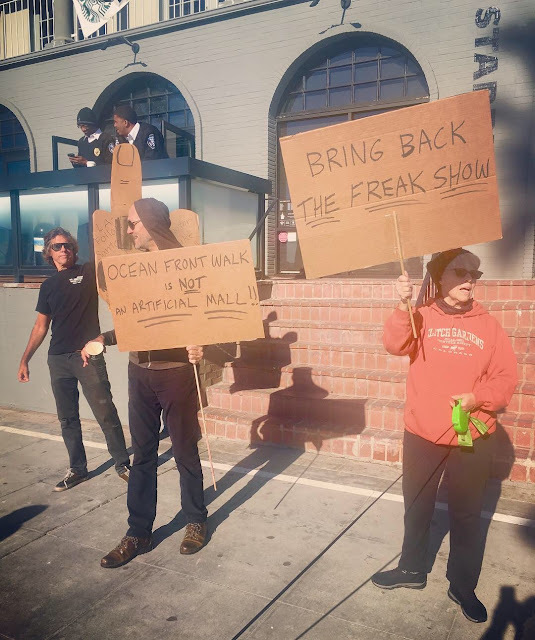 "Venice Boulevard!" with acknowledgement of the years of art and history in this place. They were laying right where the canals are painted on the sidewalk, so it had an added element of a true sense of place. Everywhere the performance passed, you could almost see the Ghosts of Venice Past. Abbot's Habit was even one of the sponsors (among many, like the Electric Lodge and Venice Community Housing), so you got the sense that this was a piece given to the present from Venice's past - both as a gift - and a warning. The other group made a circle around the big "V" statue overlooking the beach. They embraced, laughed, circled, and yelled as the wind whipped the whole chorus into a frenzy. 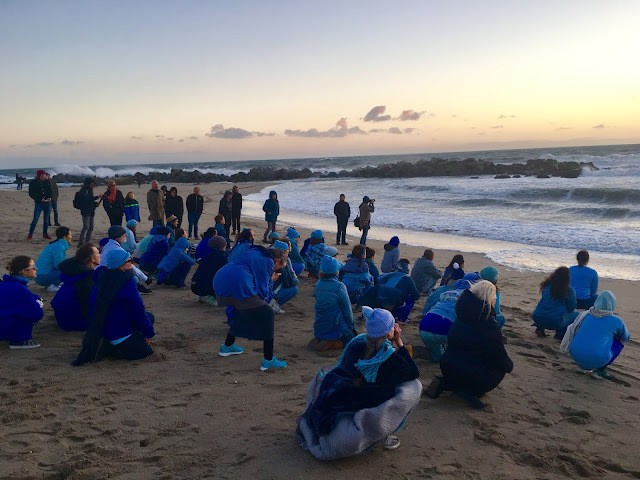 Certain performers now brought out little chime and machines that zipped and whirred in the wind, creating a cacophony of sound as the performers came together to process across the sand to the water. Everyone basically got some free micro-dermabrasion watching this piece as the sand was violently flinging sand into everyone's faces, but now we were invested and had to see this performance through to the end. 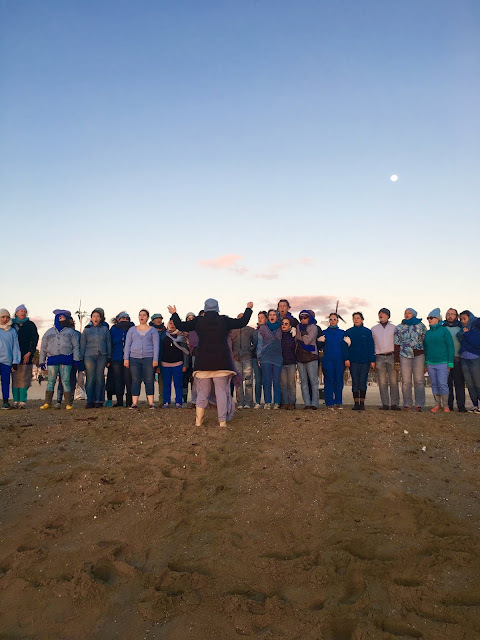 All of the dancers stood together in a big line, and the choir director woman led them through a series of higher and lower chants and shrieks as the sun set into the far western horizon. It was a beautiful conclusion to a beautiful experience - and a beautiful Sunday - as the Supermoon grew high above. I've always said the beach is kind of my church, and never felt that more so than standing there with a big group of people honoring both our town, nature itself - and our place in both. Congratulations and thanks to the Body Weather Laboratory and everyone involved in making this memorable day about a dream in Venice come to life. It will stay with us for a long time to come. May it inspire others to treat Venice with the same respect and adoration, as we together realize that time truly is a façade - and it is what we make of it. So dance in the streets! A Valentine To Venice - The Suzy Williams And Michael Jost Bravo Release Party! 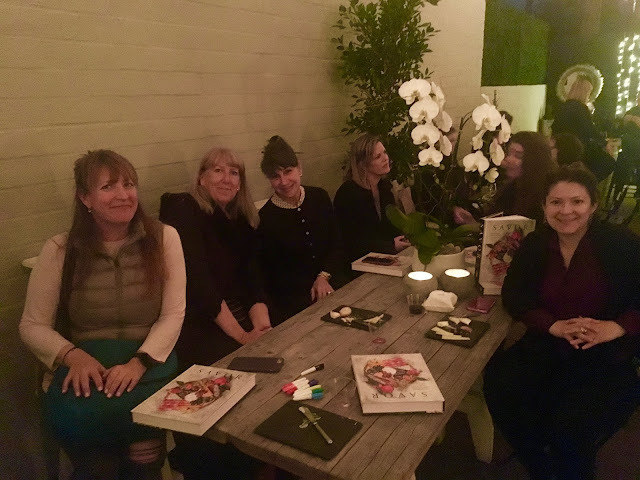 The second story of the day is about the second part of last night, which was a celebration at Beyond Baroque for the release of BRAVO - the new album from Venice (no, Global!) 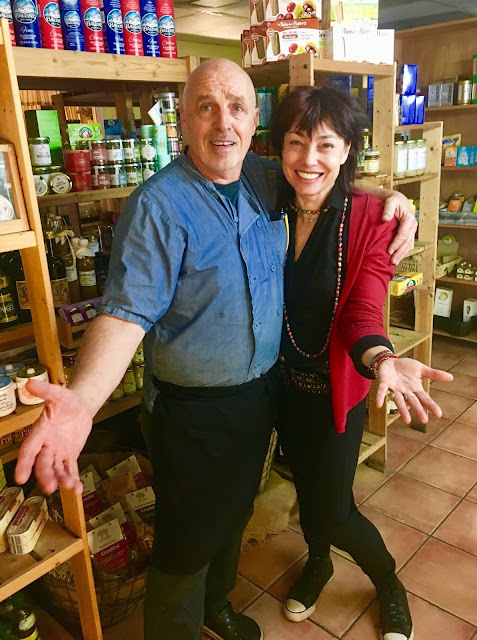 treasures, Suzy Williams and Michael Jost! There was a packed house full of old school Venetians, and love was definitely in the air on this chilly Valentine's Day. The lobby was full of Williams and Jost fans enjoying wine, chocolates, hugs, and kisses in the true spirit of the holiday that celebrates love of all kinds. Old friends caught up and new ones were made ... and then it was time for the musical extravaganza! The show was the debut of the tracks from the new album, which they played in its entirety, and in the order of the album. The first one was the title track, "Bravo", and it's hard to believe it's not an old standard, as it already sounds so classic and great. Williams was backed by her full band (of all local musicians!) from the album and Jost wove his guitar magic throughout all of the songs so seamlessly that you knew this album was simply meant to be. 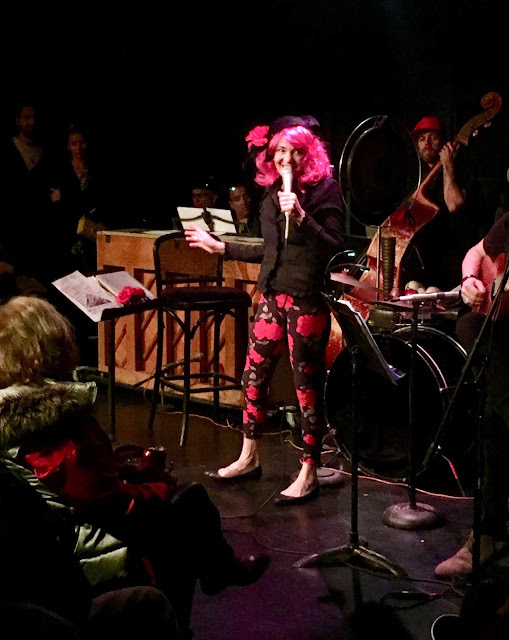 Decked out in a pink wig and red roses from head to toe (with some black lace for good Valentine measures), Williams was a lovely vision even without singing, but then she did her thing and the entire room fell in love with her (if they weren't already). 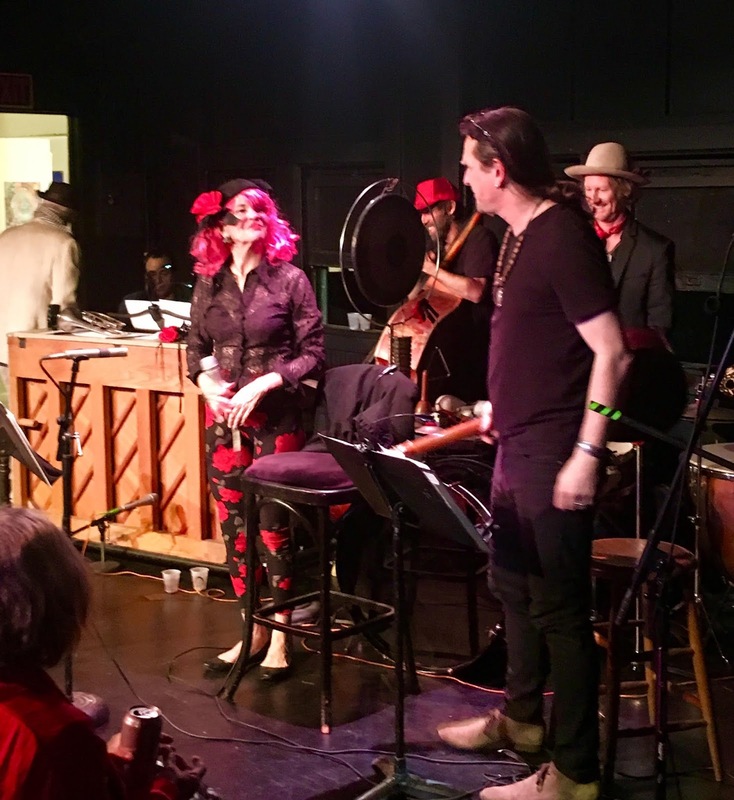 She has a way of delivering a tune that entirely immerses you in the story of the song, and looking around the full house you saw faces that were truly beaming with delight. I heard a guy near me say to his neighbor, "I love her!" - and he had a room full of stiff competition (though her adoring husband, Gerry Fialka, was front and center). Every song told a different story that Williams, Jost, and company brought fully to life. "My Lover Has Many Faces" was a favorite, and the lyrics showed off that trademark Williams humor. At one point, she yelled at Brad Kay to "Shut the door! I mean J'adore! Happy Valentine's Day! If you're in love, spread your love. If not, do it anyway!" - and that was the general vibe of the entire evening. It was exciting to see that Williams and Jost now even have merch! Fans went home with cd's and t-shirts, and there were even special BRAVO matchboxes! Awesome. Williams is one of my dearest friends in Venice, and I found myself smiling ear to ear throughout the truly excellent performance. Jost's guitar work is truly virtuosic, and you feel yourself being mesmerized. The same goes for Benny Brydern on violin, who elevated "Beat My Wings" to even greater heights. Like, people were turning to look at each other with raised eyebrows as in "Wow!" All of the musicians are the most top notch in town, and it was a real pleasure just to be there listening to them. 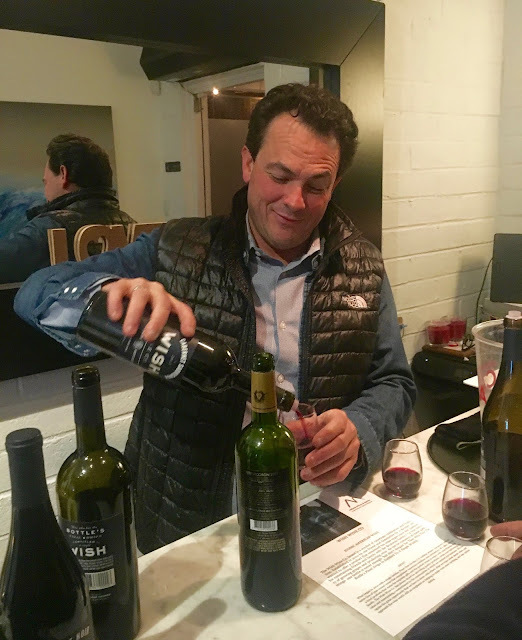 But then you get bonus bon mots from Suzy, like, "You don't need to kill a bull to wear a matador hat - and you can quote me on that!" - so I am. Songs like "The Suicide Tree" ("Our population is a disease ..."), "Beat My Wings" drew pictures in one's mind, and those Williams lyrics once again took us out of ourselves and into a place that we can all understand. This work is really something special. As are these world-class musicians, whom Williams next introduced. Almost all are longtime pals, and I was happy to see my friend, Austin Nicholson there on stand up bass being awesome. Stuart Johnson ("The third Beatle") on percussion, etc ..., Brad Kay on piano, Steve Weisberg on keys, Reinhold Schwarzwald on saxophone and flute ("Some people collect tchotckes like gnomes, I collect Old World Germans" - Suzy Williams), Benny Brydern on that gorgeous violin, and the outstanding, beautiful guitar stylings from Michael Jost rounded it all out to make a beautiful whole. "Everyone Dies" was both true ("There's a lot of truisms on this album" - S.W. ), and the last song of the night and the album. And by the way, this album and evening celebrating it are especially impressive, considering Williams herself almost died last October from pneumonia! The month before recording this gem! Wow. That gave even more weight to he sentiment put forth in song - as well as LIVED by these cool cats - was that yes, everyone dies ... but not everyone LIVES. Nights like these let you know that you really ARE living ... and living well. 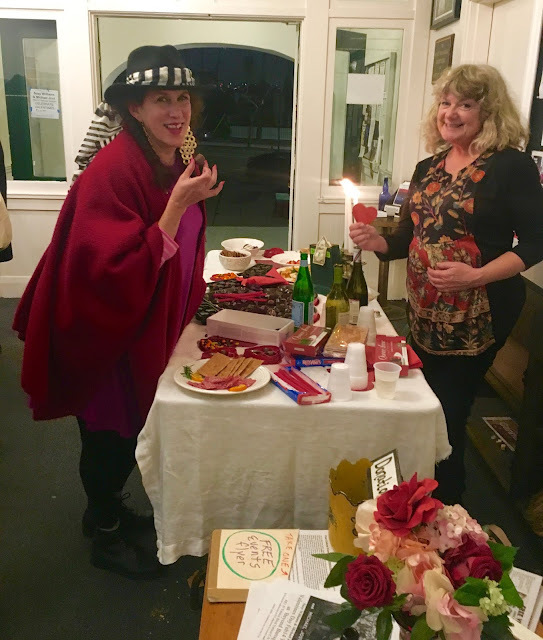 The empty wine bottles and chocolate boxes were also evidence that a good time was being had by all. 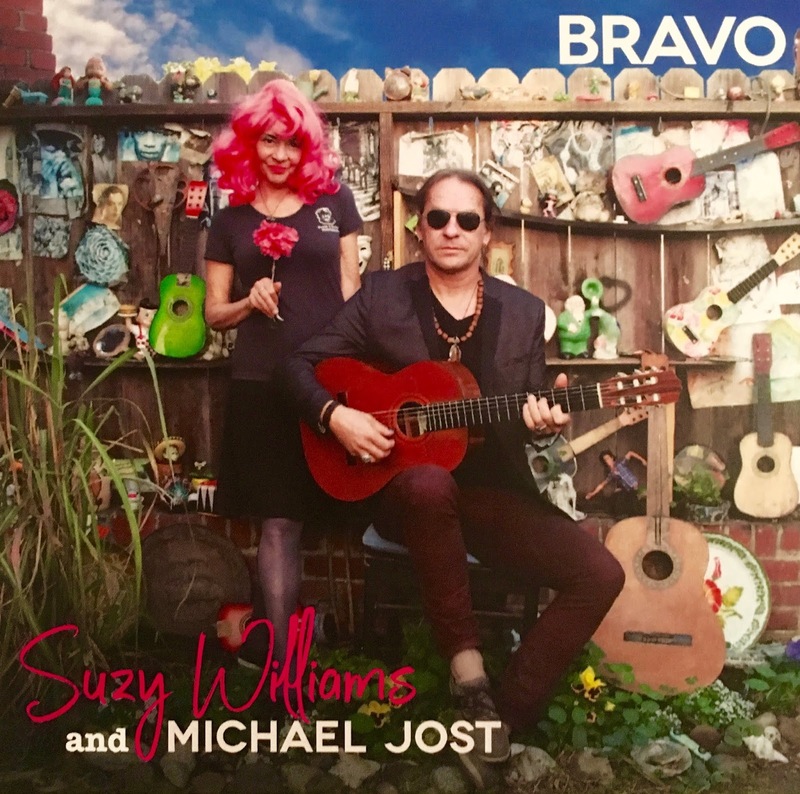 Please support our local treasures by purchasing the new album BRAVO from Suzy Williams and Michael Jost. Go see them play ANY chance you get - it really is something special. Attend programs at Beyond Baroque. Get to know your fellow Venetians. 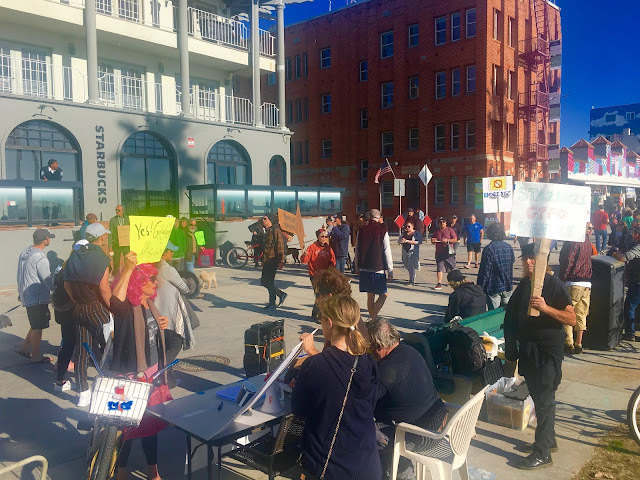 All of these things keep our community strong - and the Arts in Venice in the forefront, where they belong. Thank you (!!!) 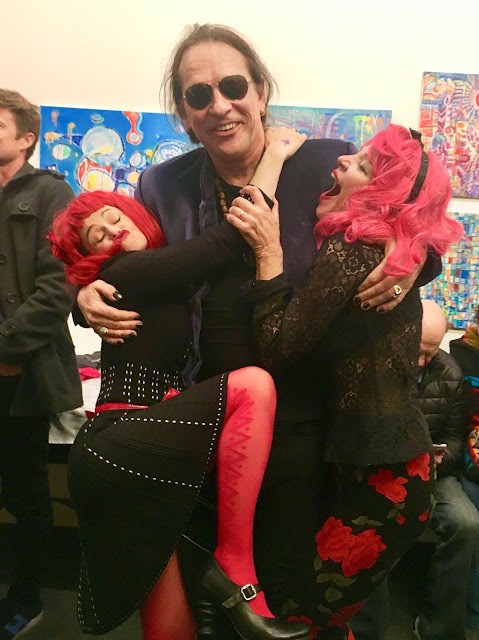 to all involved for a Valentines celebration that filled everyone with love. Love for the things that matter ... love for art, love for music, and above all, love for friends. 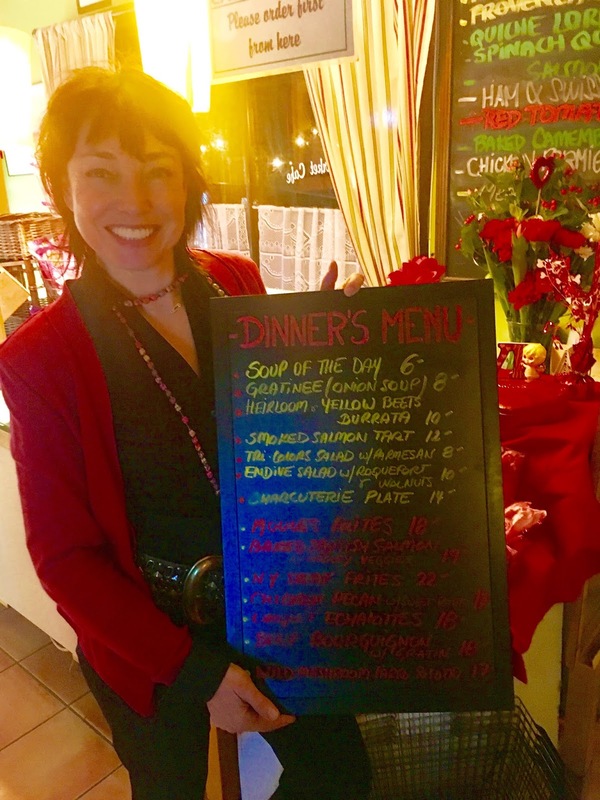 Now Serving At The French Market - Lily's Menu Is Back! 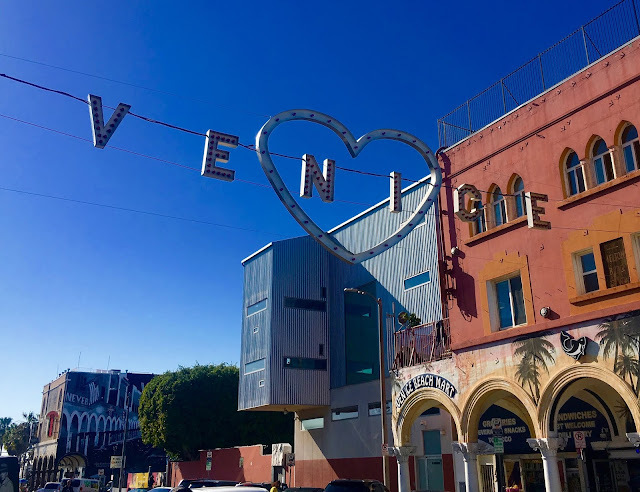 There's going to be a Blogtown double feature today, because there were two distinct Very Venice Valentine events last night that each deserve their own little story. First up, the absolutely fantastic news that The French Market Café is now open for dinner each Thursday - Saturday - and they're serving up our old favorites from Lily's (the neighborhood favorite French restaurant on Abbot Kinney that is now Neighbor, for those of you who may be new to the area)! 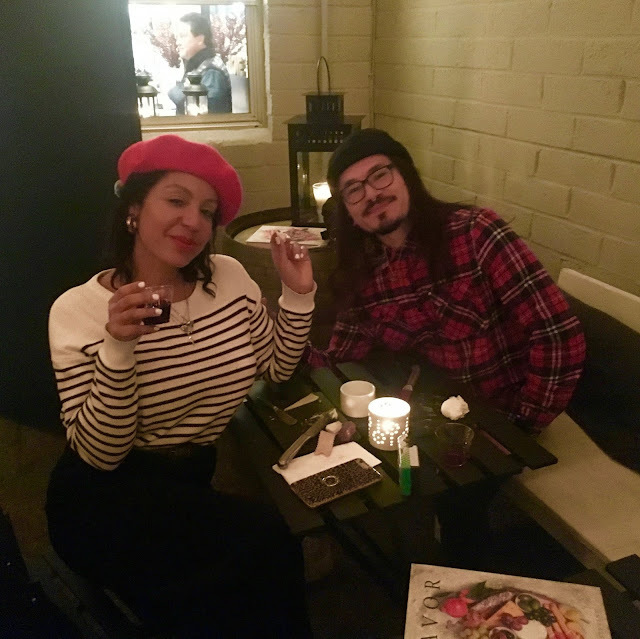 Agnes Martinez (owner of the French) and Francis Bey (former co-owner of Lily's) have teamed up to bring back the cuisine that has been SO missed by Lily's regulars like me, and last night when I finally got to order the onglet a l'echalote dish that was one of my all-time favorites. After a glass of Valentine champagne with Agnes, I tucked into my dinner, and it literally brought a mist to my eyes. A welling up of remembrance, and for people and places that are no longer here. 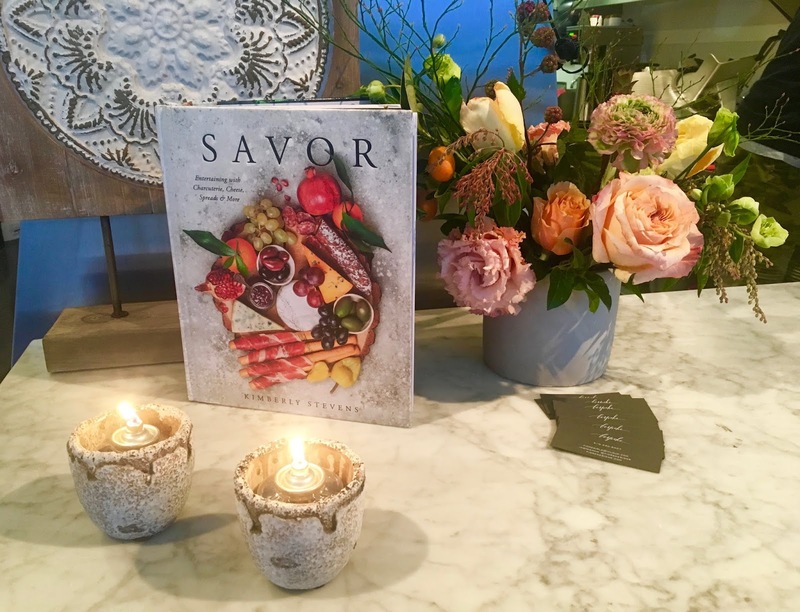 It was as delicious as I recalled, and now I'm going to be at the French even more than I already am (next up: the moules frites!). I had to go backstage when I finished, to hug and thank Francis for making my old culinary dreams come true again. He told me he was going to put a burger on the menu instead, but I had begged for the onglet for so long that he put it on the menu for me! I'm so grateful, and telling everyone to go there so I get to order this more often is the very least I can do. Please GO! There are several other classic Lily's dishes, and desserts (creme brulée, tarte tatin) to go along with them. A bonus to the French being open at night is that we can finally drink all of their wine from their cellar with dinner! These are exciting times. I couldn't stay and hang out as long as I would have liked, as I had to skedaddle over to Beyond Baroque to catch the album release show for my dear pals, Suzy Williams and Michael Jost (the next story in the queue), but I was so very pleased to be able to attend the opening night of dinner service at my beloved French Market! 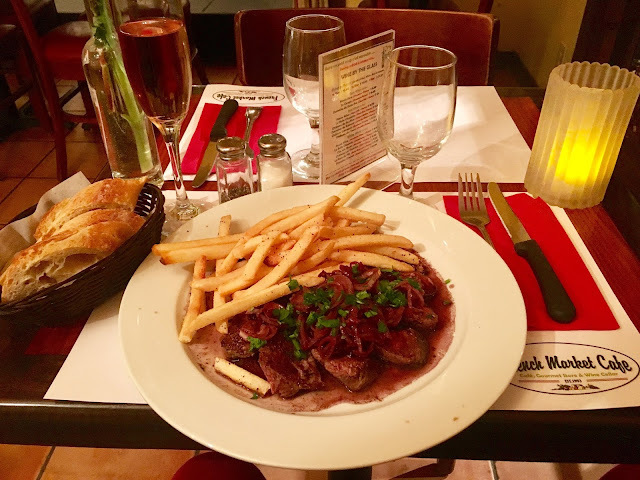 So ... the next time you're talking about where to go for dinner (on a Thursday, Friday or Saturday, for now), hit the French (free parking! 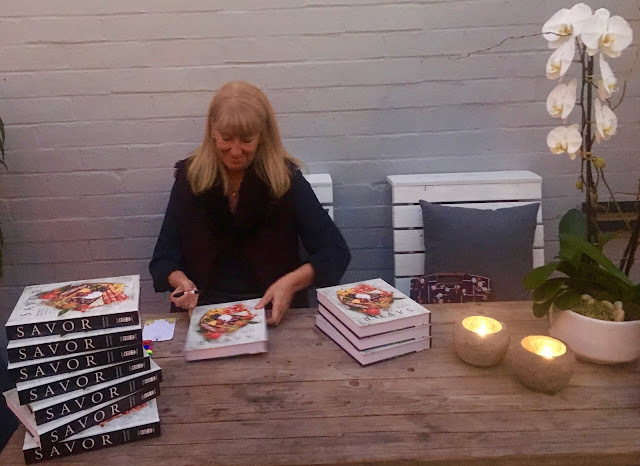 ), sit outside, sip some wine, eat some Lily's food, and tell them "Carole" sent you! There's a new message to folks visiting the Venice Boardwalk just in time for Valentine's Day ... Arms are for hugging! I couldn't agree more, and that's the message of love I send out to the world on this day intended for the celebration of love. (Thanks for the art, Trek Thunder Kelly!) Especially on this, the one year anniversary of the Parkland massacre. It's kind of fantastic that there is a day set aside just for love, right? 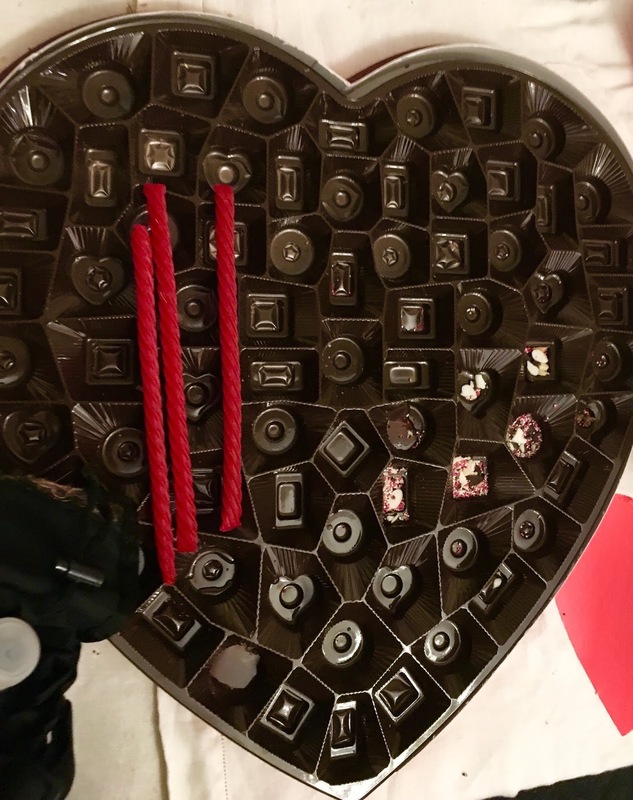 We all know it's a "made up holiday" and all of that, and can cause a lot of bitterness for those without a significant other - and believe me, I've been there. 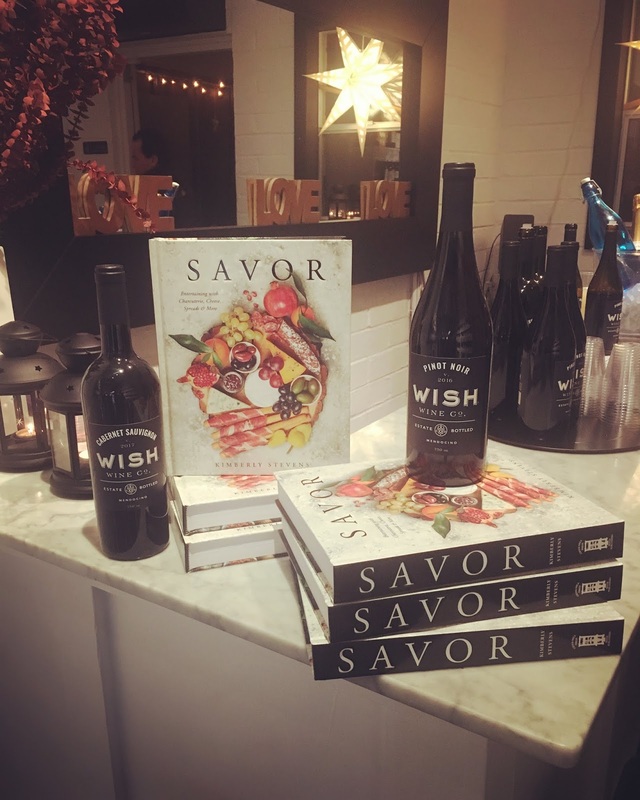 But I was helping out my friends at Fiore Designs who get absolutely swamped for Valentine's Day, and I helped answer the phone to take orders and write out cards. People, there is still SO much love in the world! This day magnifies it, and this world needs so much more of it. Many of the messages weren't even for lovers ... one Dad called and the message he asked me to write to his daughter made me tear up and have to clear my throat to continue, it was so sweet. We agreed that the best one of the day was "I love all of your curves, but my favorite one is your smile." Not bad. It's cute how nervous people get about what they want written on their cards, and I felt a bit like Cyrano for a couple of emotionally challenged fellows. It was adorable. A bonus was that all of the negativity going around felt like it vanished, even for just a few precious hours. LOVE prevails! 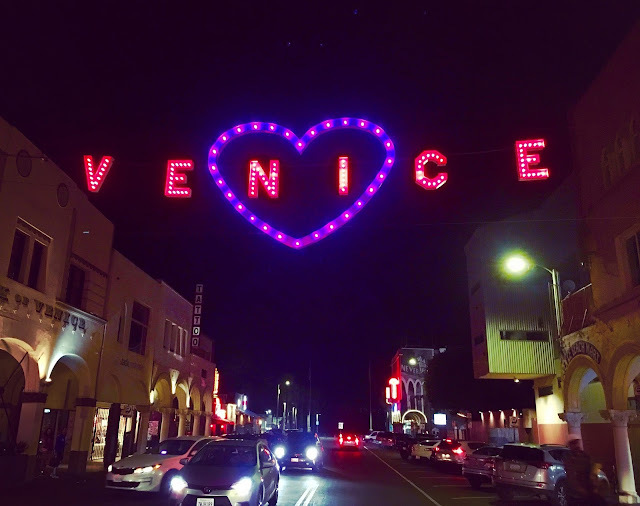 The Venice Sign knows ... and is once again blowing up social media feeds for this V Day. It's cold and rainy but we know the sun will return, and that love for our fellow humans will keep us warm anyway, at least inside. Let yourself feel it, even you, Cynics. Thank you. I love you for reading! 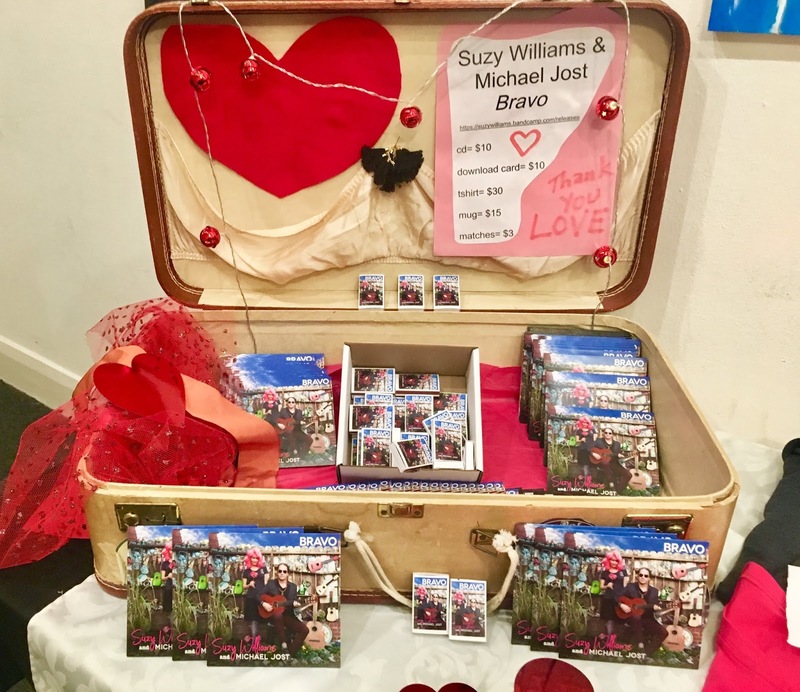 *If in the Venice vicinity and need Valentine plans, tonight is the Suzy Williams and Michael Jost album release party of their new project Bravo! at Beyond Baroque at 7:30 p.m. It's going to be a hoot, and I promise there will be extra love ... enough to go around for everyone!